Issue three is here and so is my recap of the issue. Like the previous issues we got a shot of the secluded cottage. This time we see a game of chess being played between two people. We are not told who they are, they are referred to as the Pale King and Dark King. Their faces are hidden in shadow but you can still make them out. Angela has a flashback to when she first met Tony Stark and the Guardians. She remembers stark telling her about Earth and its inhabitants. The mutants, the super powered being, the monsters, but what of Asgardians? We jump right into the fight between Angela and Thor with Angela in complete control. through the whole fight, Thor doesn't land a single blow. 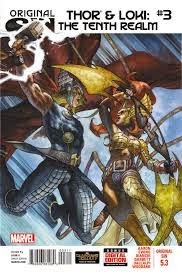 Although he is physically stronger, Angela's speed is too much for Thor to handle. Meanwhile, Loki is having tea with the Queen of Angels. She reveals that she was appointed to be Earth's protector by Odin himself, to keep Asgardians from doing harm to the planet and it's people. In the end she betrayed Odin. The queen was only concerned with rewards and payment; a mercenary that would sell out a client in an instant. 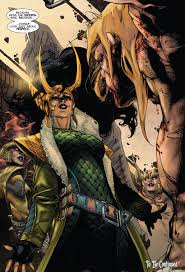 The Queen made deals with the enemies of Asgard, uniting them together. She offered Odin a chance to pay her off in order to betray those enemies. Odin of course refused. He recognised her as the honorless scum she was. The Queen had absolutely no concept of what honor was and meant to the Asgardians, she saw ans an empty concept that Odin used an empty reward for his people's work and sacrifices. And this is what brought about the war between Heven and Asgard. Angela has Thor down and out, ready to slit his throat when she is stopped and ordered to take him captive. Chained up, Thor awakens surrounded by Angela, the Queen of Angels, several Angels and their newly appointed Mistress of Strategies, Lady Loki.